Besides its famous WWII memorials, Kanchanaburi abounds in limestone mountains and refreshing rivers, providing a haven for adventure seekers, nature lovers and those seeking peace and serenity. With its variety and diversity of activities, Kanchanaburi is a perfect getaway place for anyone. We start riding slowly on small country roads with very little traffic along irrigation canals and through vibrant green rice paddies to Nong Khao village. Here we will explore the rural thai's way of life. Take a train and travel on the infamous death railway built by prisoners of war during WWII. We cycle on country back roads to Wat Prasat Muang Singh, a 12th-century Khmer temple and to the memorable and historic Hellfire Pass. We end our memorable trip by spending the day with elephants at a sanctuary for sick, old, abused and former street elephants. We visit the famous sites, but we also see some places off the beaten path to expose you to true Thailand. To turn a short trip into a real holiday you can add our Khao Yai Wine Country tour to this tour and receive a 5% discount on the total price. Transfer from Bangkok and ride on quiet local roads with little traffic. Through small villages and rice fields, we roll to Nong Khao Village to experience the local's rural way of life and take a lesson in Thai dessert making. We'll walk around the war cemetery and learn about the tragic history of WWII at the War Museum before boarding a local train for a stunning ride on the Death Railway. Visit Krasae Caves and bike to Prasat Mueang Sing where we discover the ruins of the ancient Khmer empire. Spend the whole day taking care of retired elephants by planting food for our big buddies. Once you feel comfortable, prepare to get wet as it's time to rub, scrub and bathe our giant friends! Overnight at a safari-style resort nestled next to the river. After the transfer to Hellfire Pass we take a walk through this 1000-metre pass cut through rock by POWs. Visit a Mon village, an ethnic group originally from Burma, and learn about their way of life. Tonight we spend the night right on the river at an eco floating hotel! 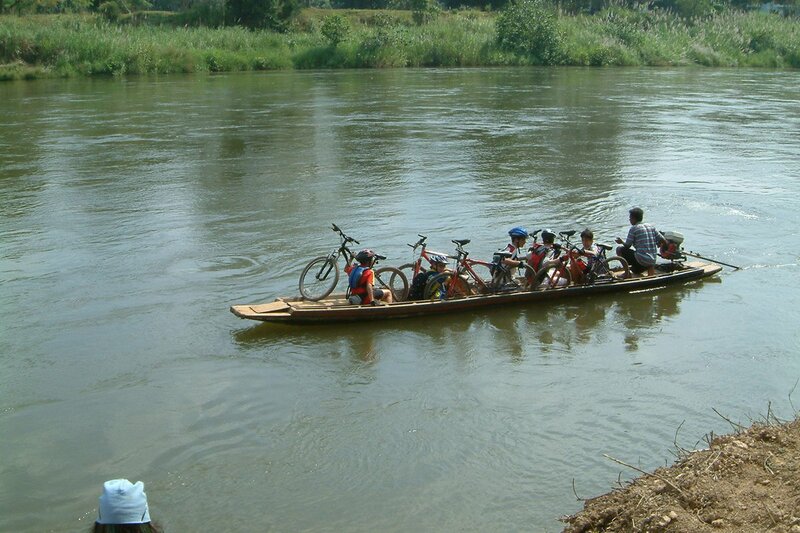 Today we will float down river on bamboo rafts, a popular mode of transport here in Thailand's wild west, and visit Lawa Cave before hopping on the bikes for more fabulous riding through a variety of vegetable and fruit farms, rubber plantations and rice fields. We have now done two tours with SpiceRoads. Our comfort and safety were always number one priority. These tours are full of fun and amazing cultural experiences. All the guides we've had the pleasure of being with have been extremely knowledgeable, answering any and all questions, and keep the days filled with adventure and new experiences around every corner! Our drivers are always close by with a lift, great drinks and snacks. The accommodations are always fantastic, albeit maybe a little different some days, but clean and comfortable, sometimes luxurious! The food is simply amazing and there's always so much of it!Thank you for the fabulous tours!! Good pace, informative guide, particularly thoughtful of young kids and everyone's interests. Brilliant way to explore a country and good balance between culture and exercise. Great family holiday - especially with an excellent guide Boro!! My wife and I would like to thank you for a wonderful cycling experience We are not cyclist as such but Jike our guide was patient and gave us the best time imaginable. Both he and the driver, Wone looked after us with enthusiasm and provided us with delightful meals enjoying Thai food very much.Thank you. We ride on small back roads with little traffic and some short off road sections. The terrain is undulating with one major climb of 2 km, but if it proves too difficult, our support vehicle is always close by. This tour is suitable for anyone with minimum biking experience. Biking Conditions: This trip is a mixture of wide, hard-packed dirt trails and smooth tarmac. An air-conditioned bus travels behind the group to support us, and participants can cycle as much or as little as they like and still enjoy the same views as the rest of the group. We will pick you up early from your Bangkok hotel and head west out of the city for about two hours by car. Then it's time to stretch those legs with a bike ride! We take small, quiet local roads with little traffic that wind through quaint villages where the locals will greet you with friendly smiles and cheerful waves. Riding along irrigation canals will lead us to the heart of rice fields and you will quickly understand why Thailand is one of the world's leading rice exporters. We take a break at a small charming temple where our guide will tell you about the importance of Buddhism in Thai life. After lunch at a local restaurant, we continue our exploration of rural life as we ride to Nong Khao Village before we transfer to our riverside hotel in Kanchanaburi city where you can relax by the pool. After breakfast, it's a short transfer to visit the famous bridge over the River Kwai. We'll walk around the War Cemetery and learn about the tragic history of WWII at the War Museum. We then board a local train for a stunning ride on the Death Railway. After lunch and a visit to Krasae Caves we start biking along some great trails, passing by some teak plantations and small Thai villages on our way to Prasat Mueang Sing. This historical site, covering some 74 hectares, is believed to have been used by the Khmer Empire as a trading point along the Kwai Noi River. We ride around the park and visit the museum before packing up the bikes for a short drive back to our hotel. We ride directly from the resort this morning on a back road, through the quiet countryside with karst mountains as a backdrop to Elephant World, a sanctuary for sick, old and abused elephants. We will spend the whole day taking care of these gentle giants. Here, we will work for the elephants as they are now retired, by planting their food for them – banana trees and sugar cane, and preparing, cooking and feeding sticky rice balls to them. After lunch it's bath time and once you feel comfortable with your buddy, it's time to get wet! Clean, rub, scrub and bathe your giant friend. After spending a day with them, you will learn firsthand that elephants are one of the most gentle animals in the world. We say good-bye to our new friends and transfer to our safari-style resort nestled next to the river. For early birds, there is the option to give alms to monks at dawn with a walk across a suspension bridge to a temple. After breakfast we visit the Hellfire Pass Museum and then walk through the 1000 m pass, cut through rock by prisoners of war with only the most rudimentary of implements. We return to the tented camp and cycle to our next hotel, the Jungle Rafts. Along the way we'll stop to visit a Mon village, an ethnic group originally from Burma, see their way of life and learn about their strong belief in Buddhism. In the afternoon there will be time to absorb the beauty of nature from your terrace above the water. In the evening we enjoy a cultural Mon dance, a fun and entertaining performance. This morning we will float downstream on a bamboo raft. This traditional method of transport allows you to see water buffaloes coming to the water's edge and the odd fisherman. Once we dock we'll dry off and go for a quick visit to the Lawa Cave to see stalactites and stalagmites in many unique formations. Our bikes will be ready for us as we emerge from the cave and off we go through the surrounding countryside. The first part of the ride will be on country lanes and then we'll hit some dirt tracks and great trails through farmland where eggplants and many kinds of Thai herbs are widely grown. We have lunch by the river, then get in the van for the drive back to Bangkok. Depending on traffic, we should arrive in the city around 5 pm. Bike hire is included in the tour. Child bikes and tag-along bikes (for ages 5-11, max weight: 38 kg/85 lb) are available. Adult must be an experienced rider to pull a tag-along and preferably have experience with tag-alongs. The bikes are well-known makes of hybrid or mountain bikes (depending on the tour) with lightweight alloy frames, 24- to 27-speed gearing, v-brakes and Shimano components and front suspension.